What Information Is Needed for a Loan? A payday loan, sometimes referred to as a paycheck or cash advance, is a short-term loan designed to offer a borrower enough money to make ends meet until his next payday. While helpful in theory, payday loans come with very high service fees. Borrowers often find themselves trapped in the vicious cycle of using much of their paycheck to pay fees, only to need to borrow more money from payday lenders. There are ways to escape the cycle by getting rid of payday loan debt. Calculate how much you actually owe. 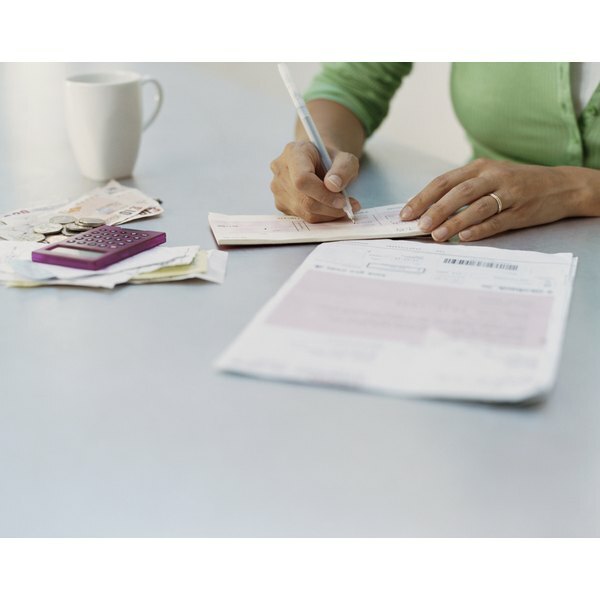 Pull together all documentation of your payday loan debts and add them up. Once you’re able to find an exact figure, you can write it down, circle it and be on your way to finding the necessary means to erase it from your life. Earn more money to pay off the debts yourself. You can choose to pick up an additional job, begin a profitable hobby such as selling artwork, hold a weekly yard sale or ask friends and family to donate to your fund. If you combine all four, you will have even more financial power. Allocate all extra income to paying off your debts; start by paying off the smallest debts so you can accrue enough to pay off the large ones. Pay off debt with a credit card. If you can’t create enough money to escape the debt cycle, you will likely see less debt by paying off your payday loan debts with a credit card. Many credit card interest rates are high, but they are also often quite low when compared with the high service fees of payday loan companies. If your credit card company has offered low to no interest rates, use them to your advantage. Hook up with a debt-consolidating company. A debt-consolidating company is a third-party assistant that will gather all of your debts into monthly payments. Although the consolidation company will also charge high interest rates, the rates won’t be anything like the fees set by payday loan companies. Furthermore, a good payday loan debt-consolidating company will take on the stress of dealing one-on-one with the payday loan companies. It will also try to make the debt payments work with your budget. Set a budget and stick to it. No matter what method you choose to get out of debt, you will have extra money to pay off your debts if you free up some of your current income. Your new budget should cut out all superfluous expenses. To figure out what these expenses are, pull out a few months’ worth of receipts and highlight all of the expenditures that weren’t absolutely essential. Promise yourself that you will enjoy such luxuries as great rewards once you’ve paid off your payday loan debts.